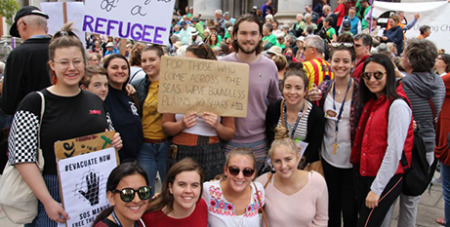 Australia’s failure to sign the Global Compact on Migration late last year was a missed opportunity, writes Jesuit Refugee Service’s John Haren. Source: The Southern Cross. The GCM was signed in December by 152 countries. Although non-binding, the intent of the document is to commit nation states to a set of universal objectives. These objectives relate to issues such as preventing smuggling and trafficking, providing accurate information to migrants, facilitating fair recruitment in relation to employment, reducing vulnerabilities in the migration process, managing borders well, and investing in skills development. Sadly, Australia, which had been heavily involved in negotiations on the development of the GCM, was not a signatory to the final document. To the chagrin of other countries, it withdrew from negotiations at the eleventh hour, with Prime Minister Scott Morrison stating the agreement could "undermine Australia’s strong border protection laws and practices". The workshop included representatives from the Vatican, United Nations High Commission for Refugees, the International Office of Migration, and the Cambodian Government. Bringing together delegates from across Asia to discuss more coordinated efforts for addressing the movement of people across the region, its themes were based on Pope Francis’s mantra to welcome, to protect, to promote and to integrate. – John Haren is president of Justice for Refugees SA.